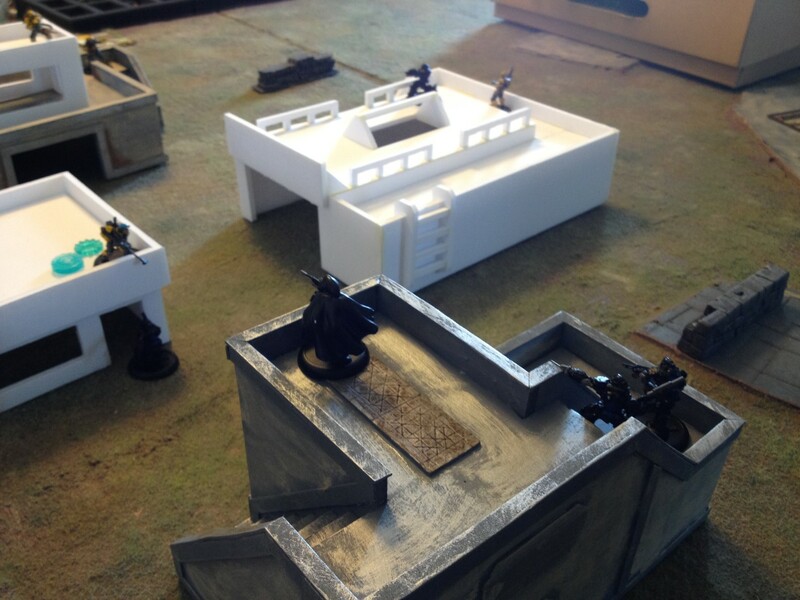 For those that don’t know MERCS is a skirmish level tabletop miniatures game. 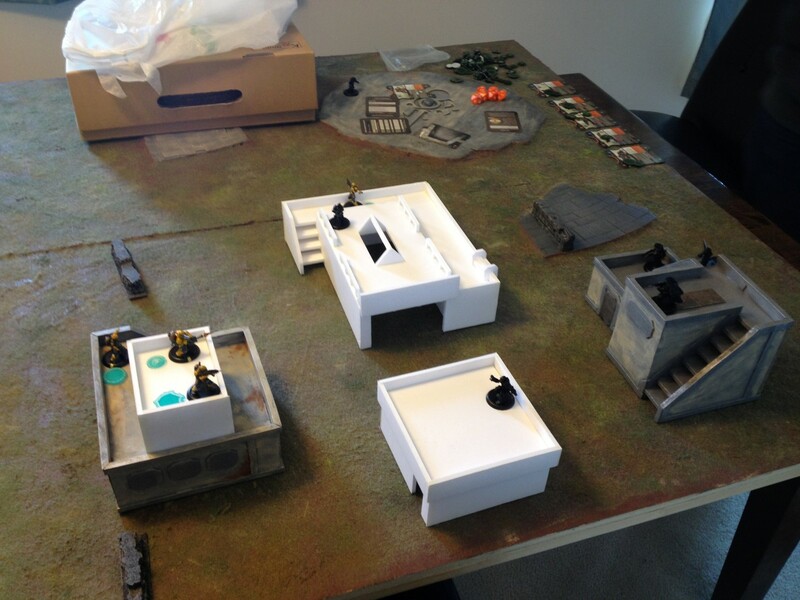 Each starter set comes with 6 models, stat cards and dice. The standard size game format is 5 vs. 5. Army composition consists of picking the 5 models you want to take without any doubles. There are no points to worry about and no complicated army composition rules. My CCC squad consisted of: Assault Leader, Demo, Medic, Heavy, Sniper. 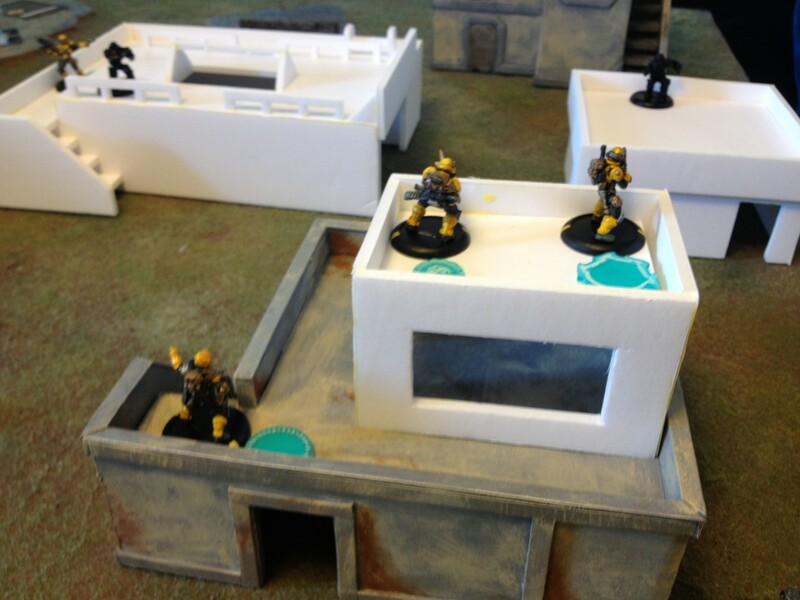 Marc’s Kaeizai Waza squad had: Daimyo, Pathfinder, Forward Observer, Sniper, Heavy Hybrid. We rolled for deployment and Marc won so he placed his Daimyo and we alternated until both squads were out. -My Sniper, Demo and Heavy bound to my medic and they all move up as far as they can. The Demo an Medic get up on the building and the Sniper moved up the right side. -The leader moved up the left. -Marc bounds everyone including the Pathfinder to the Pathfinder and they all move up as far as they can. 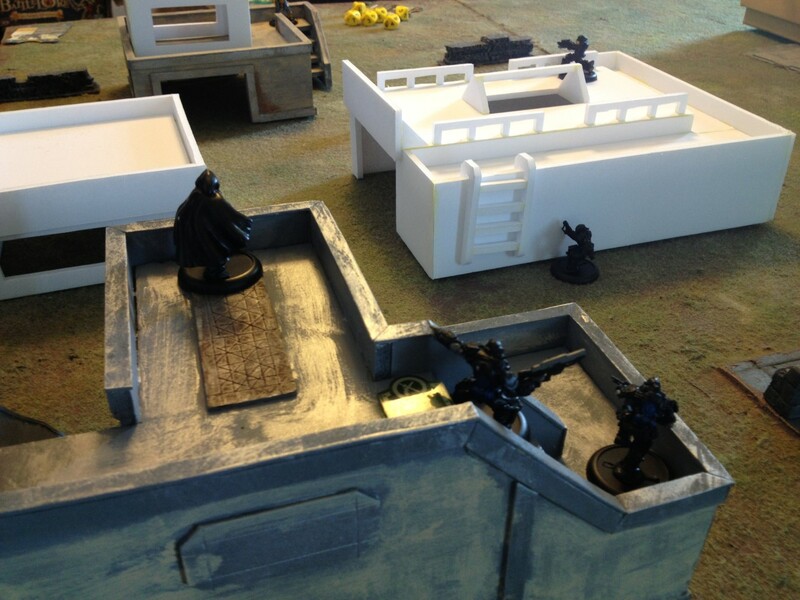 -The Sniper and Leader get up on the building and the Heavy moves up to the base of it. 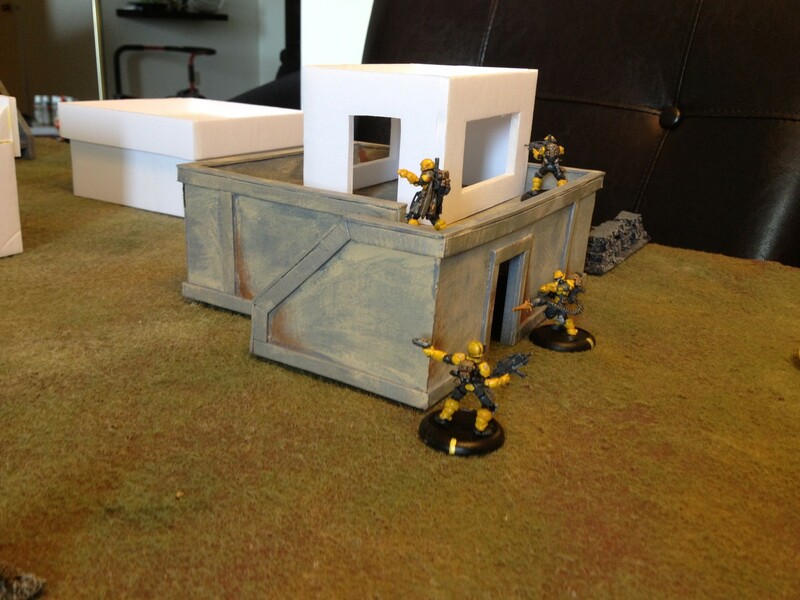 -The Forward Observer and Pathfinder move up the right side. -CCC Demo goes first and suppresses. -Waza Sniper tries to shoot and fails his courage check. 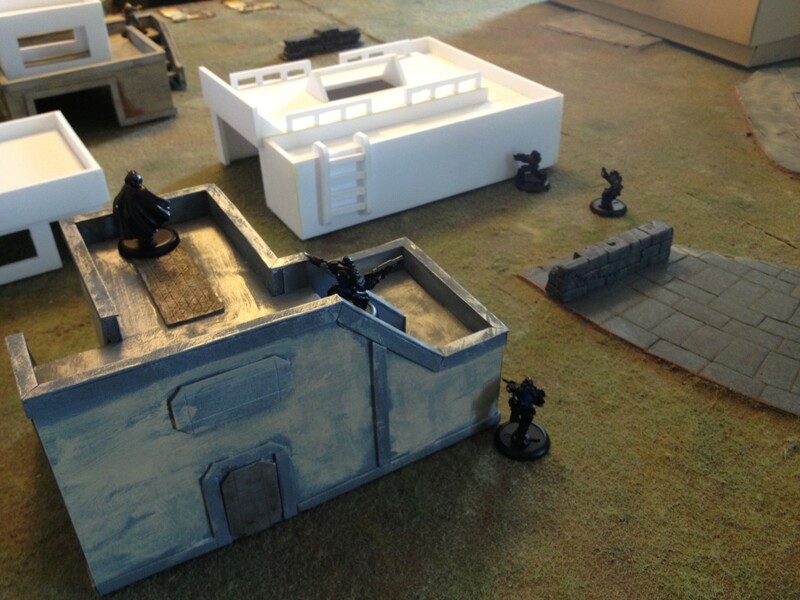 -On the Waza side the Pathfinder climbed up the building and got behind cover. 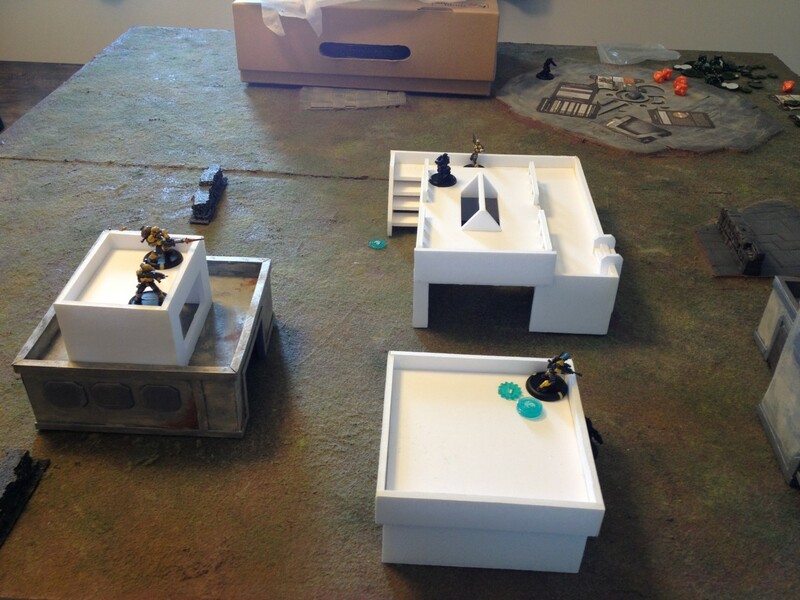 The Forward Observer moved toward the center of the board behind the building and the the Daimyo went on suppression. -CCC Medic fired at Pathfinder and missed both shots. -Snipers acted simultaneously. CCC sniper moved up onto building. Waza Sniper fired on CCC Leader hitting him for 1 blood he passed his armour check. -CCC Heavy snapped forward and set. -Pathfinder fired on CCC Leader and missed. -FO moved to the edge of the building. -CCC Demo went back on suppression. -CCC Demo continued to suppress. -CCC Heavy was going to unload again but he failed his courage check. -CCC Demo goes on overwatch. -CCC Medic goes on suppression. At this point we actually end the game due to time constraints. It was a nice demo of what the game is like and both of us can’t wait to play again. We didn’t get much more than a few potshots at each other in the game but it was fun. I horribly misused my Leader in this game. I made a fair number of attack rolls in this truncated game but my hit rate was very low. It would have been a lot smarter to have him closer to my other troops. Particularly the Heavy who did a surprising small amount of damage considering the number of dice he was throwing around. 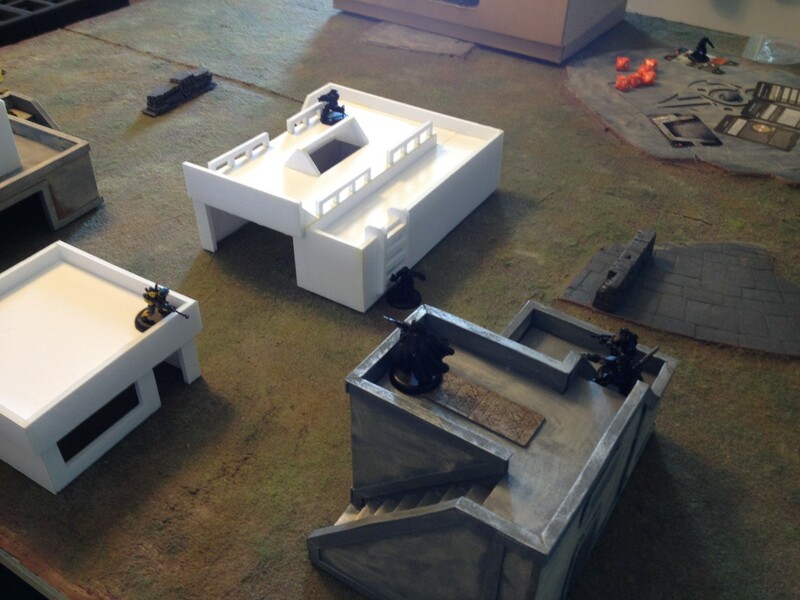 Our Warmachine games are famous for using too much terrain. 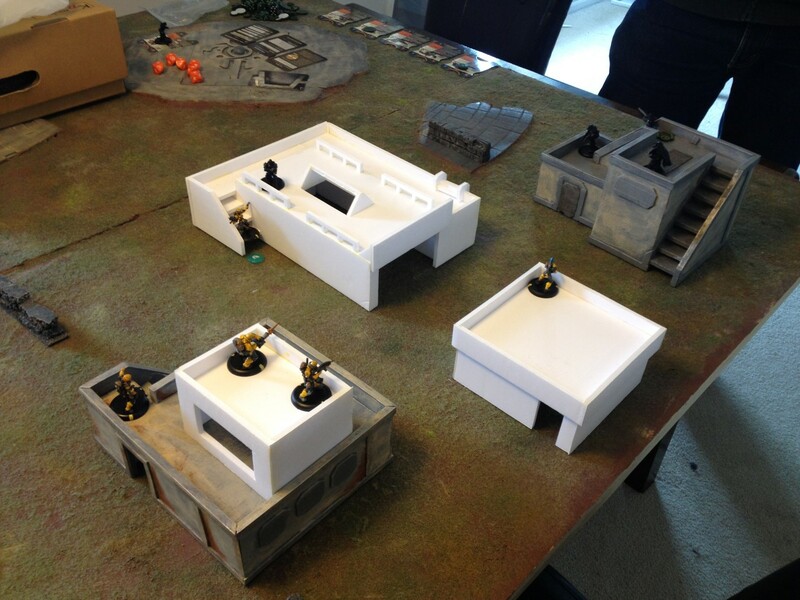 This is one of things that drew me to MERCS was that you can play a much more terrain heavy table set-up. 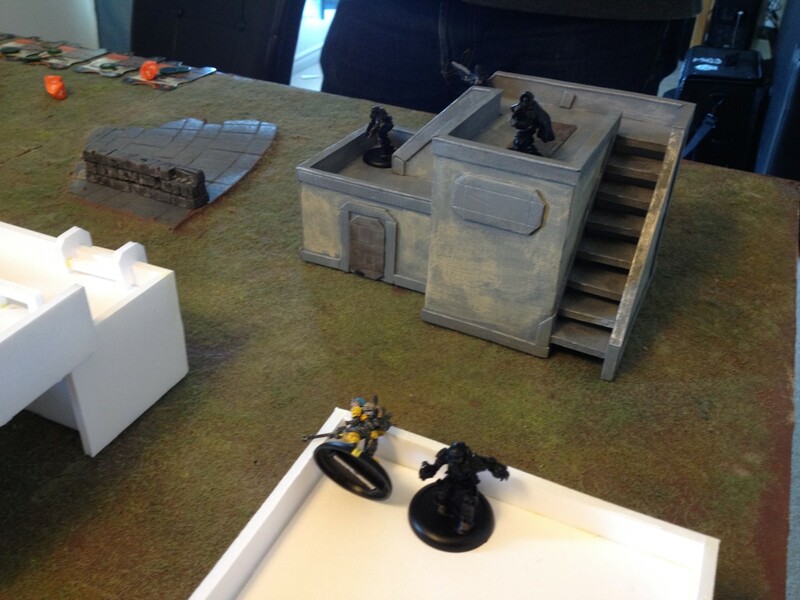 I liked using the large amount of buildings but one thing I thought the table was missing was some LoS blocking terrain that you couldn’t just climb up on top of and then be able to see everything again. It was just a little too easy for both of us to get up on a high building and have almost everything in LoS for suppression or overwatch. I’m thinking something like some billboards might be a good addition for that. For our first game I also think we should have played 3 vs 3 instead of 5 vs.5. Its a lot of new stuff to keep track of at once for the first time and that would have made it easier. Unlike the MERCS designer’s recommendation I would not play the game without CCMs and ACMs. I think they are a really important part of the game and playing without them would be like saying beginners should play Warmachine without Warcasters. 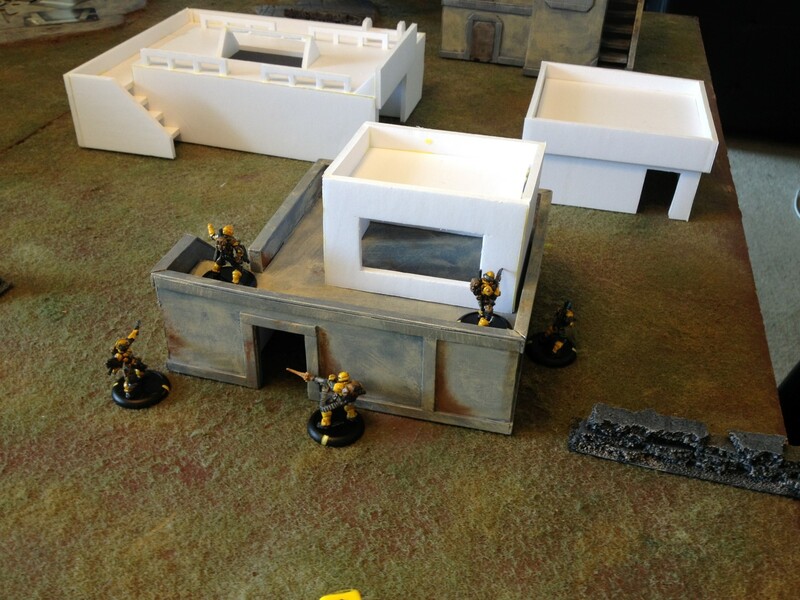 This entry was posted in MERCS and tagged Battle Report, CCC, Keizai Waza, Mercs by Nick. Bookmark the permalink. Great Batrep! Love the terrain. 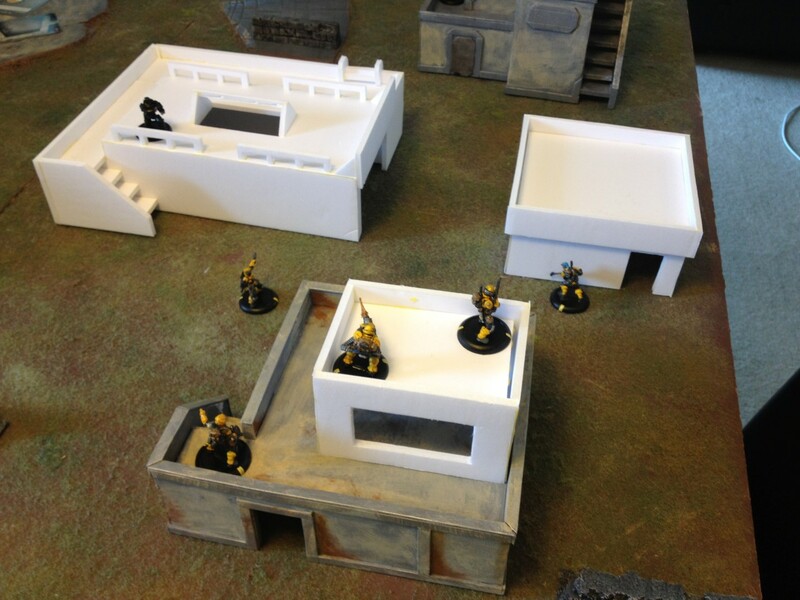 I’d suggest using some ER 1 terrain like barrels, walls, on the street and keep elevation out of the deployment zone.Game looked fun! Look forward to more. I joke, of course… the game was really too early to tell, but I think you’re right, there needs to be more LoS blocking stuff. 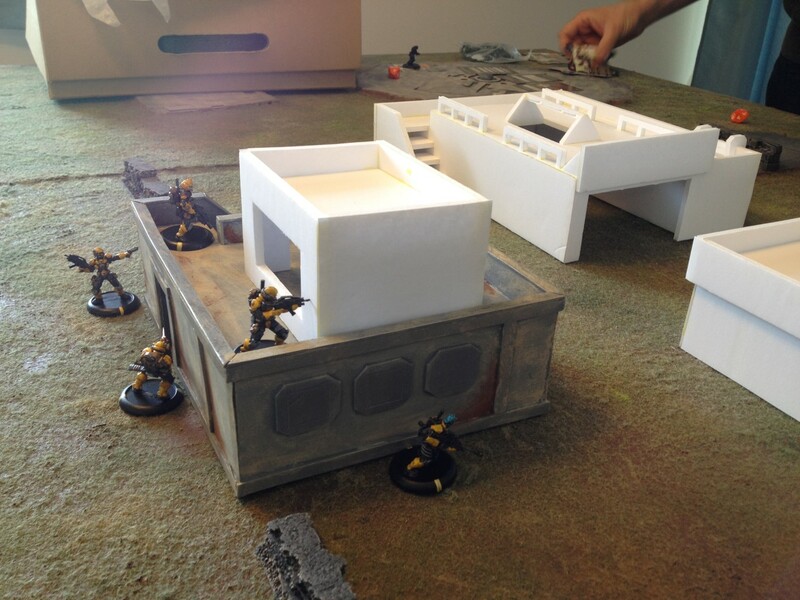 I picked up a bunch of city-terrain that I’m hoping we/you can use, which may help (buses, cars, phone booths, dumpsters, etc…), but other than that it was pretty fun! I can see potential… it’s not the same as WarMachine, which I love with my whole heart and soul, but it is fun, and quick, and that’s nice sometimes. Plus, my guys carry around a nuke. And that’s awesome! Glad to see you guys are getting started with some MERCS games. I’m just getting into the game, myself, so it’s cool to read your process. Marx, where did you get the terrain you’re talking about? 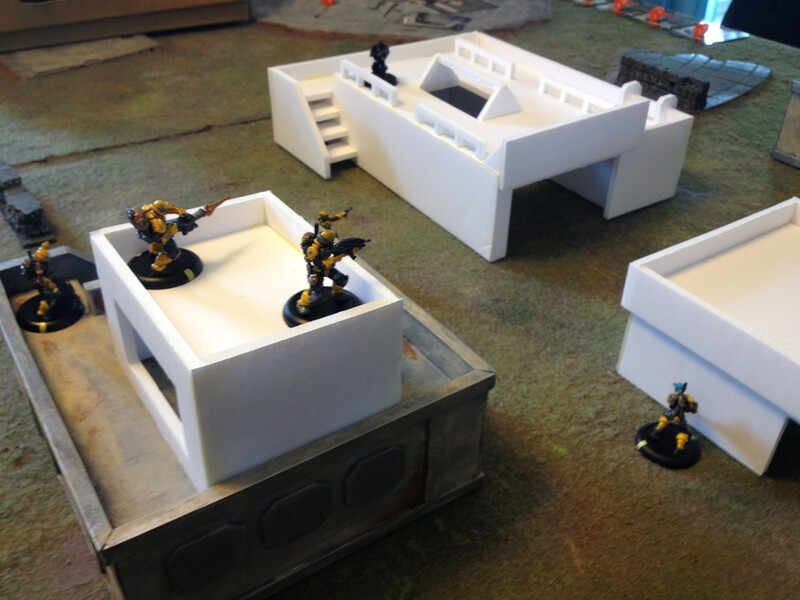 I’m working on Nick’s building templates right now (which are just blowing up the MERCS forums, congrats on that), but a decent smattering of “random crap” would help bring the battlefield alive. Glad you’re enjoying the reports! It’s a neat little game (and Nick is an extremely talented building designer… shoulda gone to be an architect, I tell you what!). 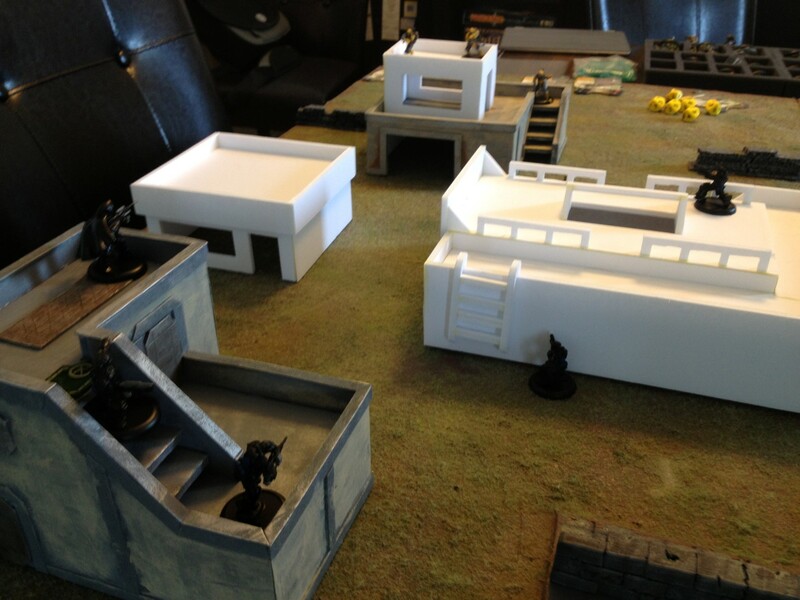 The papercraft terrain I’m talking about (and making!) is from a company called “Worldworks”. There will actually be a post (already in the pipeline) all about the stuff I’m doing for MERCs coming out on Friday! So check back tomorrow (7am EST) for more information. I *think* Nick is also going to do another report for the game we played on Tuesday… so you can see 2 or 3 pieces of it in action. Honestly, though, we need a new board… grass just doesn’t work with MERCs. But that’s a future-problem, and will probably be solved with a simple grey board.